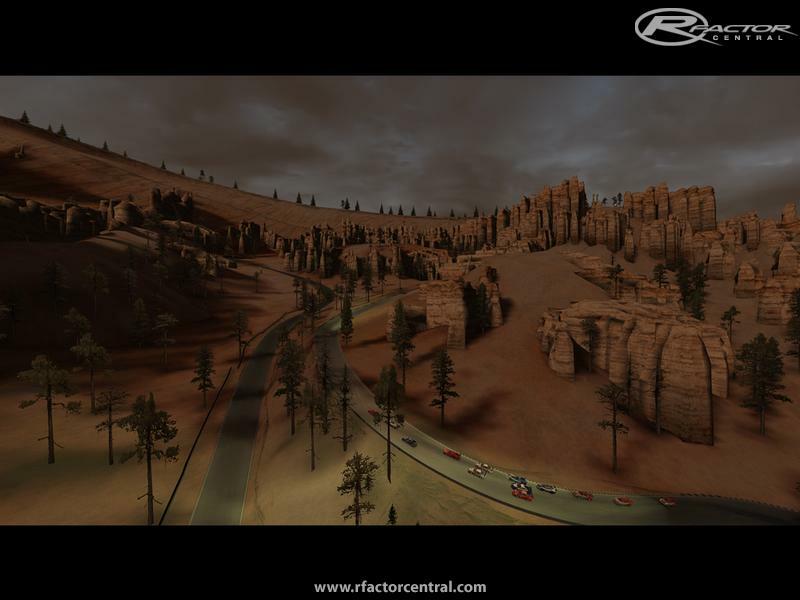 This is the final version of Bryce Canyon Raceway for rFactor 1.
v2.0 features complete overhaul of the track vegetation; 3D trees and grass layers (only visible at full track detail), increased resolution of tarmac texture, added rubber reflections, improved non-RFE version: now both versions have 24-hour lighting. Also I've attempted to fix the framerate drop which occurs when multiple cars collide and car debris fall and roll all the way down from the cliff. I've forced debris to stay on the road, and that improves framerate somehow. The fantasy scratch-made track inspired by beautiful Bryce canyon in Utah, USA. This is not 100% representation of a real place, although it's based on real data. 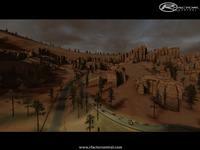 The track is 12,5 meters wide and 4,1 mile/6,6 km long, with elevation range of 464 meters. 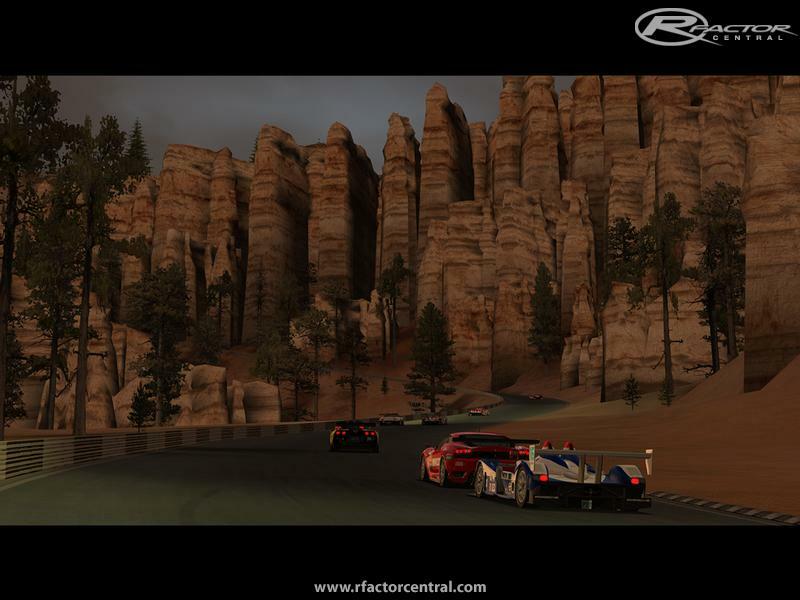 The track is inspired by, and made for HistorX Trans-Am vehicles, DRM mod, 70's open-wheelers, and other big power beasts. 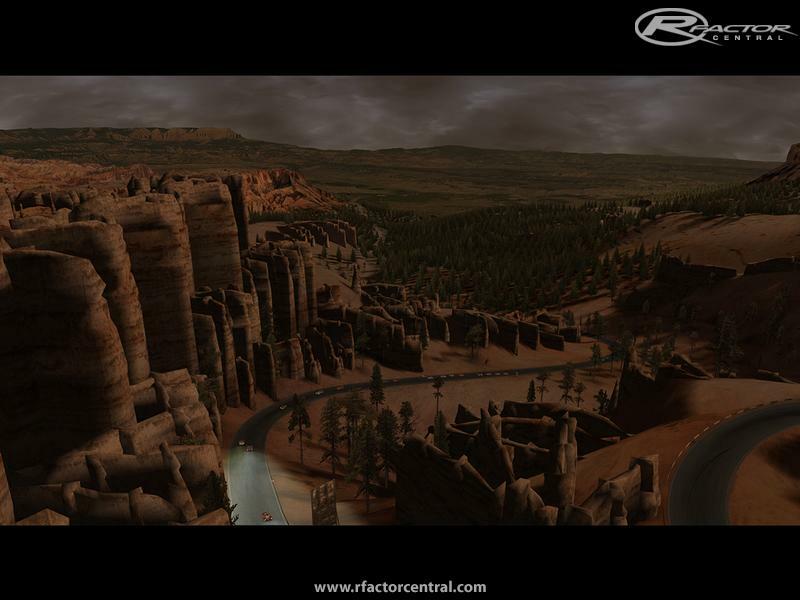 I've tried to save as much of the original canyon look as possible, and used paths and dead rivers as a base for the track. 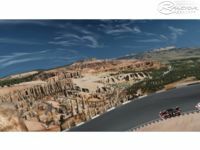 There are two versions included: standard with static sky picture and no night lighting, and 24-hour version, compatible with RFE plugin, with changing weather, moving clouds and night lighting of the pit area. You can use the 24-hour version without RFE plugin as well, but the clouds won't move and the weather won't change. 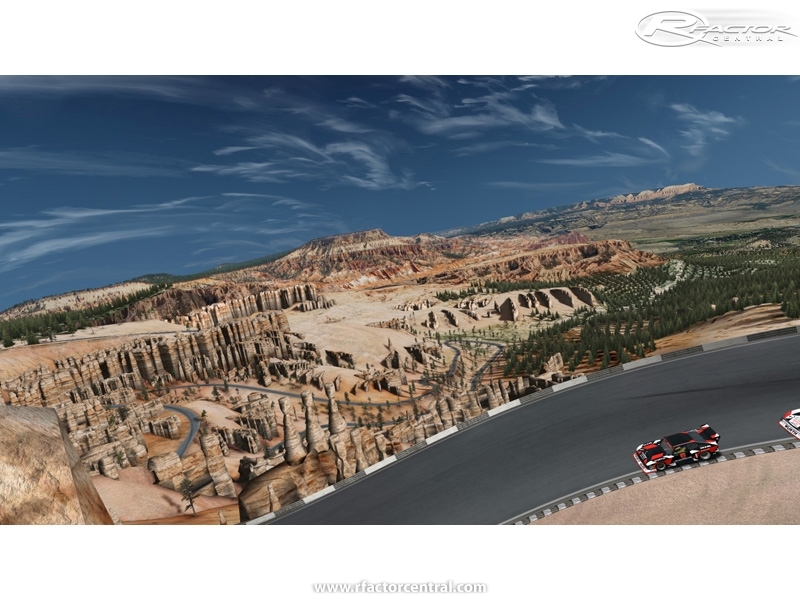 There are currently no setups for Bryce Canyon Raceway. Add a Setup. I guess it depends on a mod you use. Maybe some of mods are going too fast or too slow on this track - perhaps the easiest way I suggest is backing up .aiw file(s) and adjust parameters for WorstAdjust, MidAdjust and BestAdjust. Experiment with them and see how AI goes. Cheers NOxymoron, most likely the fps drop occurs for you because I've increased tree loading distance in the pit area. And grass loading too. In the other places they can load a little closer to player/camera but not there. You can check out the high detail instead of full, that will unload the grass. Great track KittX. 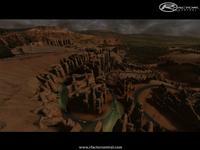 If the terrain was greener it would be like driving local roads Thanks. Just FYI, (nothing that needs a fix in my mind). I have noticed a slight FPS flutter going up the hill in the kink heading to the last corner (bank turn) in Version 2.0 that was not noticeable with the 1.02 Version. This is not an 'unplayable' issue just information for future outstanding projects. And, just a personal note, I miss the track workers, many were my race line targets. LOL. But, for realism's sake, I'm sure they would not have been in those positions if track safety was a genuine concern. 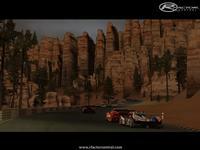 one of the best rFactor track! Having a blast with this track. Really well done both technically and visually. Thank you!! this is a great track.i would love to see this on rfactor 2 also. thanks. ? ? ????? ?? ?????? ???? ???? ????????? ?????????? ?????? ?, ??? ?